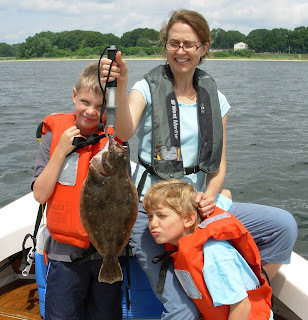 Fluke fishing: Lorna Russell of Providence with the fluke she caught off the Beavertail area of Jamestown. Her son Liam (right) and friend Mathew look on. Researcher even when off duty: Jon Hare (center), Narragansett Laboratory Director and Oceanography Branch Chief for NOAA Fisheries Service, fished with Capt. Dave Monti on Angel Light, a RI Fish for the Future cooperative member this Saturday. Jon lives in East Greenwich and by chance his wife booked the charter on the cooperative vessel for him, his son John (far right) and friend Elliot Emperor of Orleans, France. There is a new fishing cooperative in Rhode Island… the first of its type in the nation, it is called Rhode Island Fish for the Future and I am one of its founding members. It is a charter captains’ summer founder (fluke) cooperative consisting of nine vessels. The captains are voluntarily testing an innovative fishing approach to improve accountability and conservation of the summer flounder (fluke) population while increasing business flexibility and stability for the Rhode Island charter boat industry. The cooperative is also testing innovative new software they developed that records catch in real time. Each of the captains in the program has a computer tablet on board loaded with the software. The software (called Fish Net) allows captains to record species type and fish length (the software converts length to approximate weight). All of this is recorded in real time in the location that they catch/record the fish through a GPS capability. It is hoped that software like this will provide a rich data source for fish mangers in the future as charter boats and recreational fishers are presently not required to report their catch the way that commercial fishermen do. The cooperative received a grant to develop the software and is operating under proposed guidelines as they fish off a Research Set Aside (RSA) fish allocation they purchased at a federal auction. The mission of the pilot project includes reducing discards (and mortality rate… or the number of fish that die after release) and increased flexibility and predictability so charter captains can better serve customers. Captains have been able to improve customer experience by allowing them to take more fish and smaller sizes than normally allowed. This sounds great… more fish for customers, smaller sizes allowed, however, there is a catch. Captains participating in the program agree to live within a rigid set of rules. Rules such as counting all fish caught toward their quota or allowable catch for the season… even the ones too small to keep. Their cumulative total of allowable catch is smaller than they would be able to take under normal recreational fishing regulations, however, the program gives them the flexibility to catch the fish and use them with customers when it is best from a business perspective. For information about Rhode Island Fish for the Future visit www.rifishforthefutue.org. Black sea bass fishing has been OK with anglers catching them while fluke fishing. Some nice sized black sea bass were taken off the wall at the Harbor of Refuge and off Narragansett Beach. Offshore fishing had been pretty good this week at the Dump with blue fin tuna, mahi-mahi, and yellow fin being taken by a number of customers said Matt Conti of Snug Harbor. 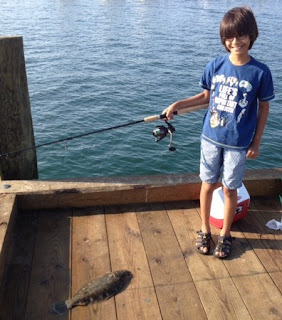 Fluke (summer flounder) fishing good. Peter and Holly Sousa landed summer fluke to 21” while fishing off Dutch Island and Jamestown, RI Sunday night. Dr. Chris Deacutis of the University of Rhode Island sent me an email this week. Dr. Deacutis and his team have measured temperature, nutrient and oxygen levels in Narragansett Bay for years. Oxygen levels in the lower part of the water column in the west passage of Narragansett Bay are very low. 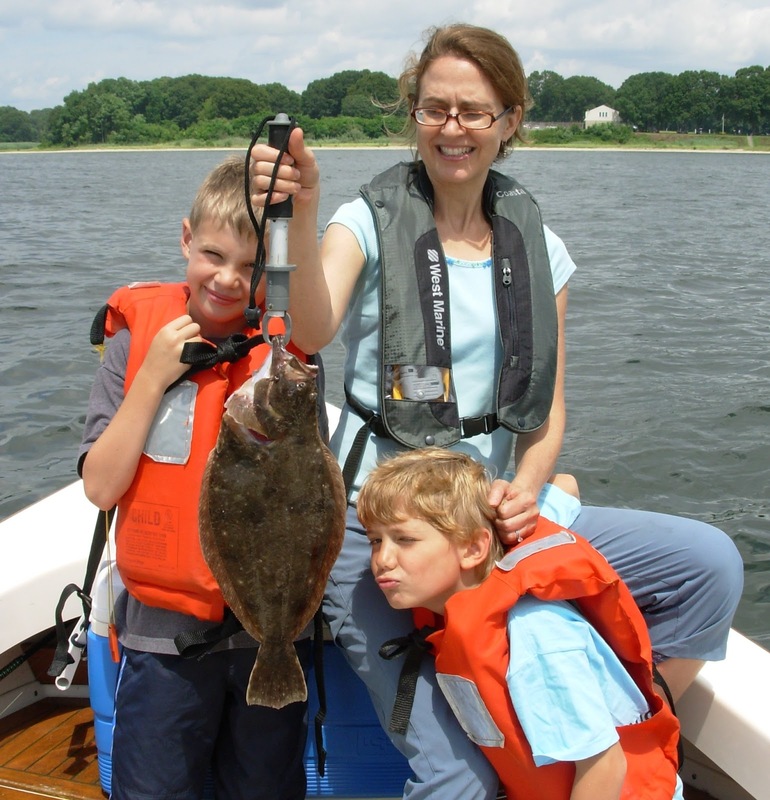 These low levels of oxygen may explain why fluke fishing in Greenwich Bay slowed this week. Dr. Deacutis said, “Just wanted to give you a heads up. We (URI and Brown University) ran an oxygen survey today and there is extreme low DO (dissolved oxygen), 0.1- 0.6 mg/L in western Greenwich Bay below 10' , and very low DO, 1 - 2mg/L= no fish, in the upper Bay and ~ 2 mg/L in upper West Passage below ~ 15-20' all the way down to Quonset Point. Probably explains why the Bay fishing is so dead. Fish leave when DO is < 2-3 mg/L . I wouldn't bother going for any flatfish (summer flounder) above Quonset. The Department of Environmental Management (DEM) will host the third event of the 2013 Rhode Island Great Outdoors Pursuit on Sunday, July 28 from 11 a.m. to 3 p.m. in conjunction with Governor Lincoln Chafee’s Bay Day at Colt State Park in Bristol. Additionally, there will be free parking at all State beaches on July 28 in celebration of Bay Day. The Pursuit event is open to the public and will feature a host of activities such as a tide pool touch tank, healthy cooking demonstration and farmers' market, electronics recycling drop-off, and hula-hooping. There is no cost to register and all activities are either free or low-cost. The general public who do not wish to register are also invited to participate in all activities. More information is available online at www.riparks.com. Canvas, Narragansett said, “Gus Ludietti (eight years old) of Killingworth, CT caugth a 32 pound striped Bass (fishing with his mother) off the wall in Narragansett this weekend while fishing with squid for scup.” Dangelo said, “ I told Gus when he was in the shop that he had light gear so he would have to play the fish and not pull hard on the line or it would break… he followed instructions well and landed the 40” fish.” Captain Rick Bellavance of the charter vessel Priority Too our of Pt. Judith, Narragansett said, “The bass bite around Block Island has been strong but the seas have been rough this week and have prohibited fishing some days.” Noted local angler Don Smith reports on fishing Block Island last week at night. Don said, “The water temps were unusually warm, ranging anywhere from 76.4 to 78.5. Capt. Matt King told me he's marked water temps during the day of 80 so the bass will be moving further north if this keeps up. The bass are moving up in the water column feeding on the surface early in the morning and at the tide changes. Using Lemiere wooden surface plugs and spinning gear we had bass on the surface to 40 lbs. early Wednesday morning. Lots of blues mixed in with them.” Craig Castro of Erickson’s Bait & Tackle Warwick said, “The striped bass bite around the Newport Bridge (and Jamestown Bridge) was very strong this weekend. Several customers caught nice sized bass while using chucks of Atlantic Menhaden.” Schools of Atlantic Menhaden were reported in the lower East Passage of the Bay between the Newport Bridge and north to Prudence Island. First fluke… first fish: Durjoy Maitra of Brookline, MA caught his first fish ever on his very first cast off the DEM pier on Salt Pond. The fluke was twenty inches and weighted two pounds. 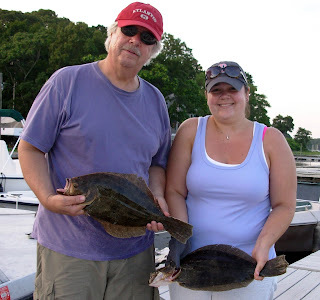 Fluke fishing is good: Josh Olczak of Maryland, Marchello and Tony Carulli of Pennsylvania enjoyed a mourning of summer flounder fishing (fluke) in Greenwich Bay last week. 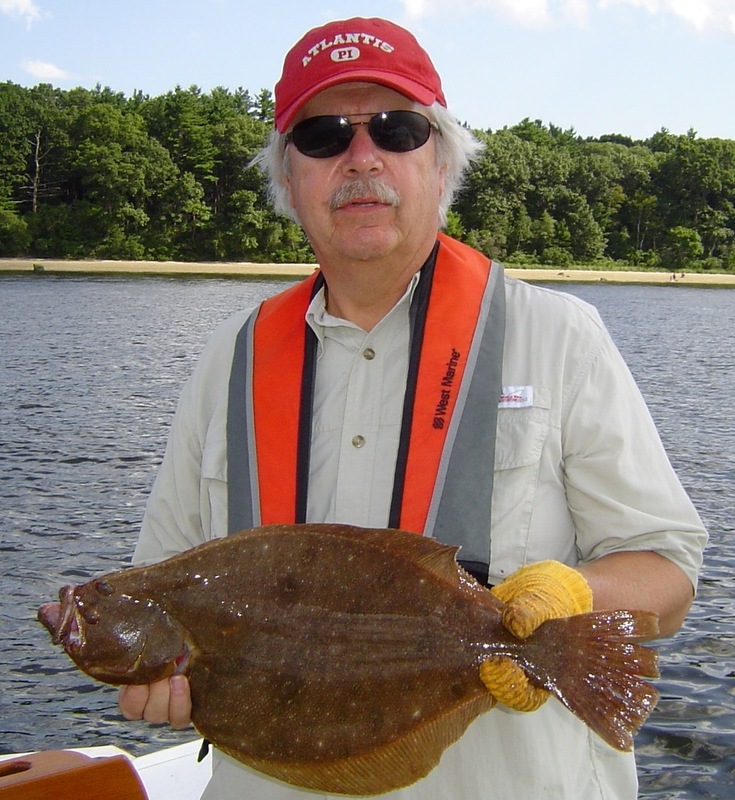 Fluke fishing has been good in Narragansett Bay, along coastal shores and Block Island. Learn how to fish for bonito and false albacore and how to take better fishing photos at the Rhode Island Saltwater Anglers Association’s (RISAA) monthly meeting Monday, July 29, 7:00 p.m. at the West Valley Inn, West Warwick, RI. Captain Eric Thomas will speak about how to catch bonito and false albacore. 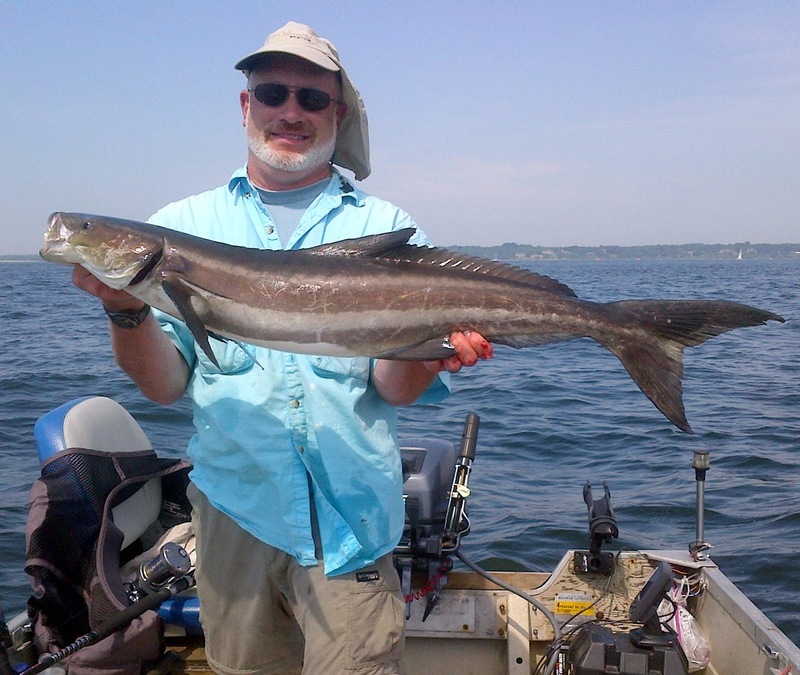 Thomas specializes in fly fishing… light tackle and often fishes the Aquidneck Island coastline for striped bass, false albacore, bonito, fluke and many other species. Steve Medeiros, editor of RISAA’s newsletter has had many photos published in the RISAA newsletter. "I can't tell you how many times someone has sent in a photo of their prized catch, only to reject it because the angler's head was cut off, or the photo is out of focus, or too dark and unrecognizable," he said. His mini-seminar will provide you with a few simple tips to make your photos more impressive, and will show examples of good and bad photos and how to easily correct them. Non-members invited to attend and are requested to make a $10 donation to the RISAA Marine Fisheries College Scholarship Fund. The West Valley Inn will be serving dinner starting at 5:30 p.m. The Rhody Fly Rodders will hold their summer fishing meeting Thursday, July 18 at Seapowet Marsh, Tiverton, RI. High tide on July 18 is at approximately 4:30 p.m. and the group will fish the out-going tide, from whenever anglers arrive until dark. A small grill for anglers to cook their own hot dogs, burgers, etc. will be available but participants are asked to bring their own beverages. Water and chips are provided. Directions: Take RI. Rt. 77 South from Rt. 24 (Sakonnet Bridge), take right on Seapowet Avenue, and follow to you get to a small bridge. Parking lot on right at bridge. For information contact Peter Nilsen at pdfish@fullchannel.net. The New England Fishery Management Council is forming an ad hoc Electronic Monitoring (EM) Working Group. Its members will be asked to identify any existing barriers or necessary steps that would enhance groundfish sector operations plan(s), in particular those plans that rely on electronic monitoring as a primary mechanism to achieve their stated compliance and catch attribution goals. The Council will appoint two fishermen, who participate in the Northeast Multispecies Sector Management Program and who are not currently on Council advisory panels, to serve on the working group. The working group also will include representatives of the Council and its staff, NOAA Fisheries Northeast Regional Office and Northeast Fisheries Science Center staff and fishermen. Please indicate your interest in participating on the Working Group by mail, email or fax and include information about the gear type you use, the areas you currently fish and any other information you think may be relevant. If you have questions or need additional information about the EM Working Group, please contact Chris Kellogg at 978.465.0492, ext. 112 or ckellogg@nefmc.org. Off-Shore. Matt Conti of Snug Harbor Marina said, “This weekend we had customers landing tuna. Four yellowfin tuna, albacore and even some mahi-mahi were caught Saturday and Sunday just on the south side of the Dump. Striped bass fishing remains strong around Block Island. Ken Landry of Ray’s Bait & Tackle landed striped bass to 41 pounds fishing with eels on the southwest side of the Block Island this past weekend said Patti Ferrara. Matt Conti of Sung Harbor said, “Customers are landing bass with eels during the day and night on the southwest side of the Island. Some are using umbrella rigs with success too.” Mike Gill of Quaker Lane Outfitters, North Kingstown said bass fishing for customers is good at Block Island with customers using eels and umbrella rigs with success. 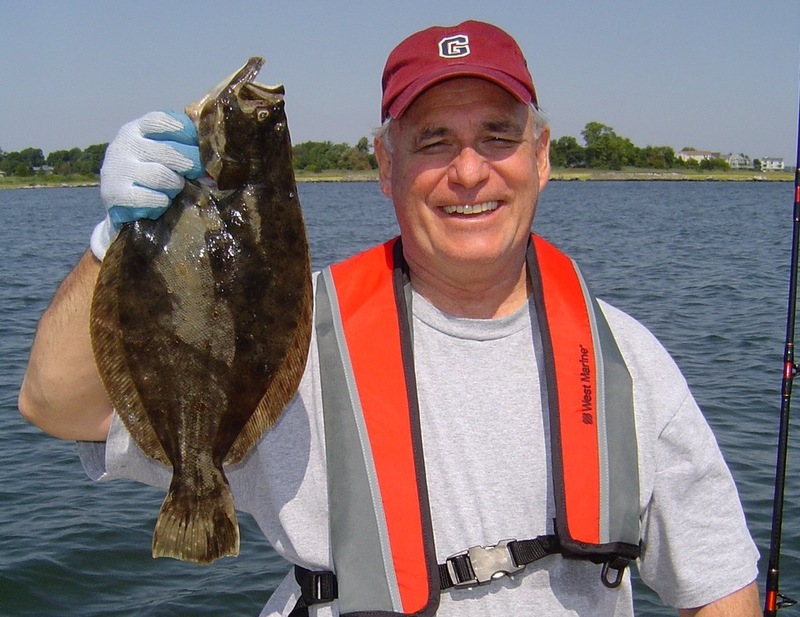 Summer flounder (fluke) fishing has been very good with fluke being caught in Greenwich Bay in numbers that haven’t been seen in ten years. Fluke have been caught at the mouth of the Sakonnet River, around Newport and Jamestown, along the southern coastal shores, and out to Block Island. Wednesday I had three anglers on board and we had good luck fishing the Greenwich Bay area from the can at Round Rock to the Warwick County Club. Many anglers fished the edges of the trough that runs between Warwick Light and the Country Club. 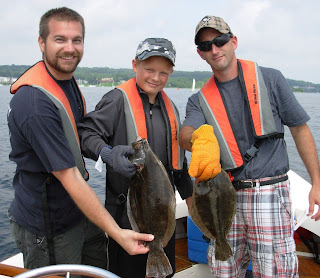 “Fluke fishing has been great. People are catching them everywhere.” said Matt Conti of Snug Harbor. Black sea bass fishing is good. Anglers are often catching their limit… three fish/angler/day with a minimums size of 13” until August 31. The catch limit increases to seven fish per anglers from September 1 to December 31. Warm water fish: Greg Vespe of Tiverton, RI caught this cobia, an exotic warm water fish, off Gould Island when fishing for striped bass with a bunker (Atlantic Menhaden) head as bait. Fluke (summer flounder) fishing remains good off shore and in the lower Bay. Pete Sousa of Warwick caught two fluke under the Newport Bridge an hour before high tide and then the bite was off. “What a fight… the fish cleared the water by three feet and then dug under the boat and ran... boy they are tough fish.”, said Greg Vespe of Tiverton, RI as he recounted his fight with a cobia he caught off the south side of Gould Island in the East Passage of Narragansett Bay. The fish was caught this past Sunday at 10:30 a.m. with a bunker (Atlantic Menhaden) head when Vespe was fishing for striped bass. “The fish weighted 17 pounds, not really big for a cobia but what a fight.” said Vespe. Cobia are a great sport (and eating) fish and commonly weigh between 20 and 50 pounds with lengths of 20 to 47 inches. According to the Florida Museum of Natural History a record cobia weighed in at 135 pounds. Cobia migrate along the Atlantic coast on a seasonal basis. In spring, they move from southern Florida, to the Carolinas as water temperatures rise. I checked online and some have been caught in Rhode Island but usually later in the summer when the water has a chance to warm. This Sunday surface water temperatures in the middle of the Narragansett Bay were in the 80 degree range so perhaps this is what enticed the cobia to come into the Bay. In fall, Cobia reverse their migration pattern and head south as water temperatures fall. A favorite food of cobia are crabs and they are commonly called "crabeater". They often cruise in packs of 3-100 fish, hunting for food during migration in shallow water along the shoreline. They will follow rays, turtles, and sharks, sneaking in to scavenge whatever is left behind. This cobia is a real prize to be caught in Rhode Island, so congratulations Greg Vespe, and thanks for sharing your story about the fight. Thresher shark: Ian O’Hara (left) of Cranston, RI hooked into this 309 pound thresher shark off Block Island last week fishing with this brother Carlin and father Dan. The shark took about two hours to land with help from Jay and Jim Noon and was weighed in at Snug Harbor Marina, South Kingstown, RI. 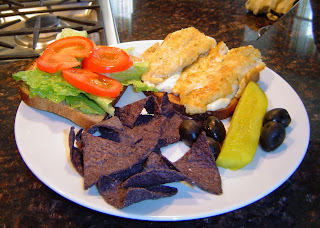 Fresh fried flounder makes a great sandwich (or fish entrée). It’s fast and easy to make. Flounder lunch plate garnished with chips, pickle and olives in Captain Dave’s kitchen. Photo by Virginia Magnan-Monti. Fresh summer flounder is fun to catch and it’s a great eating fish. Peter Magnan of Cranston, RI with a fluke he caught off Jamestown, RI. 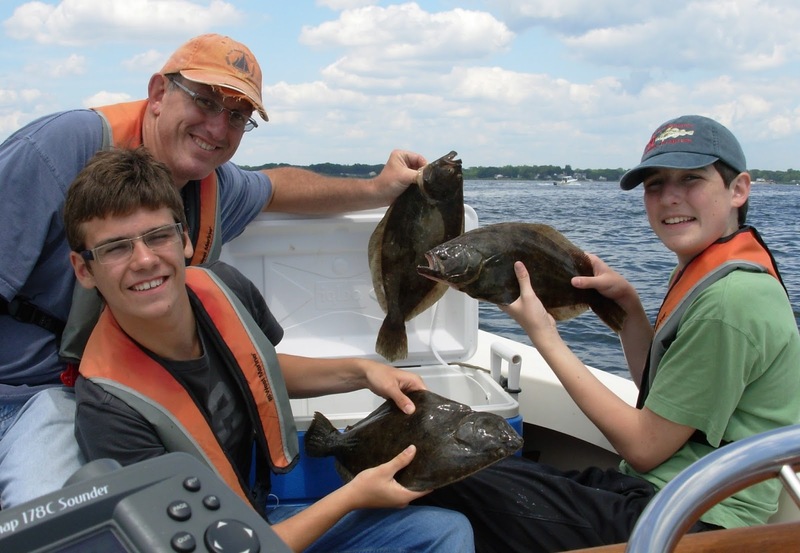 Fluke (or summer flounder) is plentiful this year and it’s easier to catch keeper size fluke as the minimum size has been reduced to 18” with a bag (or catch) limit of eight fish per angler per day. Fishing in the mid-Bay area in Warwick, East Greenwich and North Kingstown in the West Passage and off the shores of Barrington and Bristol in the East Passage has been as good as it has been in ten years. Fishing around the Newport and Jamestown bridges has been good too with a strong fluke bite all along the southern coastal shore from Newport to Westerly and out to Block Island. So if you have been lucky enough to catch this delicate, delightful, white meat fish here are two simple recipes. But first prepare flounder fillets for cooking by rinsing in cold water to clean. Carefully feel fish flesh one last time to remove any bones left from the filleting board. Pat fish dry with paper towel and set aside. · Cook 4 to 6 minutes on each side depending on the thickness of the fillet. Once cooked (fish is flaking, do not overcook) place on your choice of lightly toasted bread (we like light rye or wheat at the Monti house). · Spread tartar sauce on second slice of bread and top with lettuces and tomato slices. Cut sandwich in half and garnish plate with olives, pickles and chips. *Making your own tartar sauce is easy. Start with ½ cup of your favorite mayonnaise and add green relish to taste (two to three tablespoons), mix together and then place in refrigerator to cool. by Robb Roach from Kettlebottom Outfitters, Jamestown, RI. Lightly butter the bottom of a glass baking dish and cover with the fillets, arranged in a single layer. Place Ritz crackers into large Ziploc, remove all air, and crush into medium-fine crumbs. Cover the fillets completely with the crumbs. Melt butter in the microwave and drizzle evenly over entire dish. Place thinly sliced lemons on top, for color and flavor. Bake in a preheated 450 degree oven for 10 to 15 minutes, removing from oven when crumbs begin to brown. Squeeze lemon juice over dish, as desired, and serve. Shark fishing is picking up to said Al Conti of Snug Harbor Marina. 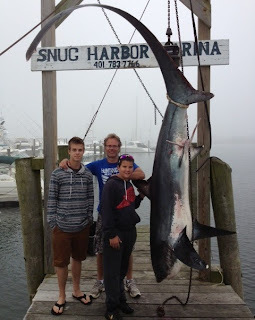 We weighed in a 338 Mako and a 309 pound thresher shark this week caught by the O’Hara family of Cranston, RI.